View Poll Results: What age bracket are you in? Yup, Big Banana was one of my favorite places. And, remember Zayre's at the Belknap Mall and The Globe where the Gilford 8 cinema is now? Staying at the "Holiday Bungalows" on Paugus Bay every summer. Bowling on the Weirs strip. Waiting in lines that took forever at The Kellerhaus. And, hitting golf balls at a driving range that is on the left hand side of the street, heading toward the Weirs, a short while after Funspot. The remains are still there. The old lights, and the land was never used for anything. It still looks very much like a driving range that was simply abandoned. I give it a look every time I drive by, and think back 30 years, of my dad sitting there, watch me hit golf balls. How does the Eddie Money song go? "I wanna go back, go back, and do it all over, but I can't go back, I know...."
Been reading this forum for awhile and finally decided to register! I'm right smack in the middle of the 40-60 age group! Some days I feel like closer to the next group up! Now come on, are you saying that there is something wrong with the next group up never mind 2 groups up???? You will be there some day and you will wish you never had said that. Angela I think it was Mammoth Mart at the Gilford 8 the Globe was at the beginning of the boulavard where those condos are now if I remember correctly and I think there was an ice cream place on the boulevard kind of by the doll house cottages, actually I'm pretty sure it was called the Boulevard drive inn anybody remember that? Angela I think it was Mammoth Mart at the Gilford 8 the Globe was at the beginning of the boulevard where those condos are now if I remember correctly and I think there was an ice cream place on the boulevard kind of by the doll house cottages, actually I'm pretty sure it was called the Boulevard drive inn anybody remember that? I remember the Globe actually being in both locations, the condo area and the Cinema 8 building. I don't remember which one first but I think it was the condo location. Remember Grants that was in the same mall as Osco Drug and Dans Star Market before K-Mart was there? Are you talking about the Drive-In ice cream place that was Bakers Drive-IN at one point and now it is a realestate office(i think) It was headed north past the gun shop. 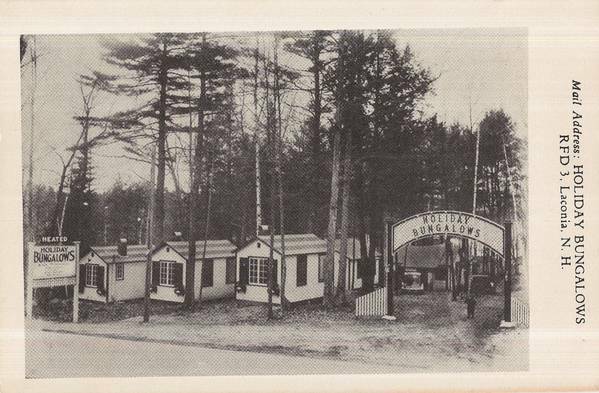 Gotta love that the sign says "heated", lol -- I remember those type cabins from when I was little and the grandparents took us on trips during the summer and renting heated cabins was a huge deal, it could get chilly even during the summer! (Not to the Lake, other areas, but that era of cabins.) Anyone know if the Holiday Bungalows had knotty-pine interior? That's what I picture. On the boat is always waterfront! Ahh the Roadkill Cafe, i remember that place in the mid 1990's with their sound effects and funny signs another place I miss. Great photo mcdude. Thanks for posting it. Did you know that before Foster’s Restaurant was built, there was a Howard Johnson’s at that location? It was moved to the Weirs in the mid to late ‘40s and burned to the ground a number of years later. Prior to Howard Johnson’s, there had been another restaurant there called “Dutch Land”, which was probably the first restaurant in this area to offer curb service. The waitresses were dressed in Dutch costumes and took and delivered orders right to the cars. I remember my mother speaking of it, as it was quite a novelty. I believe it was operating there in the late 1930’s to early ‘40s, when Howard Johnson purchased and renovated it. HEY! I'm on a roll! .... before Foster’s Restaurant was built, there was a Howard Johnson’s at that location? It was moved to the Weirs in the mid to late ‘40s and burned to the ground a number of years later. . This postcard shows the distinctive orange roof of HoJo's along side the drive-in entrance at the Weirs before it burned. Anyone remember OBIs in Alton Bay? The Oak Birch Inn on Route 28A heading toward Wolfboro. Had docks and full movie theatre in the back with bar, restaurant and rocking chairs spread throughout the porch areas. I believe burned to the ground in the 90s? I keep thinking "be quiet,you're done, now"...and then another memory looms! Chickie, help me out with this one, I know you'll recall this, because you remember everything...and save all that old, precious stuff. How good is that!! In the 60's there was a HUGE statue of (??) Paul Bunyon (?? )on Union Ave., pretty near Cantin's. We lived in CT at the time, and our little girls would wait anxiously to spot that statue, knowing they were almost at their grandparents, for a weekend visit, AKA "Anything your little hearts desire will be yours"! Also, during the visit they'd look for the huge chimpanzee, with the banana, atop The Big Banana. Did that sign last the whole time BB was in business?? 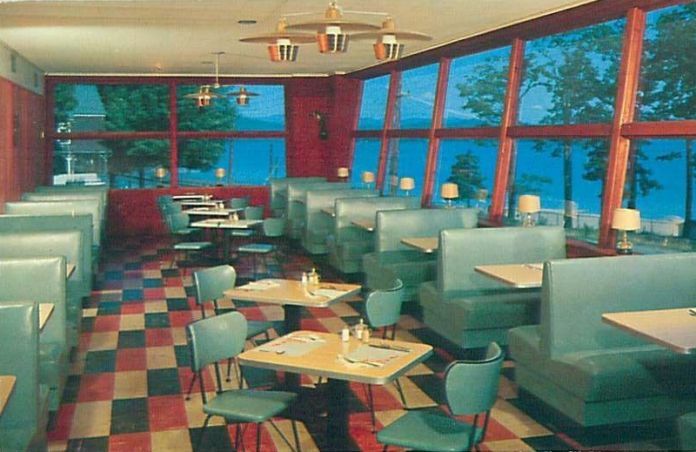 BTW, I ate at the Howard Johnson's in the Weirs, quite a few times....ah, the "28 flavors"! I tryed to post a link but I can't. The Paul Bunyan statue was in the parking lot of the Time Out Pub on the corner of Bridge Street. It was later the Backwater Grille (or something like that). It burned a few years ago and was finally torn down after several years of being boarded up following the fire. It never reopened. The Chimp sign at the Big Banana was repainted several times and remained to the end. I will definitely hold on to my Tom Mix memorabilia, as I fully intend to enter the pearly gates wearing my whistling ring and glow-in-the-dark spurs, with the Indian arrowhead hanging from my neck. The built-in compass should prove most useful for the journey. Re HoJo’s: After it was moved to the Weirs, the lot remained vacant until Foster’s Restaurant was built. Around 1946-47 a circus came to town by rail and was unloaded in Lakeport. The animals were walked from the station to McIntyre Circle where the tents were erected. Every kid around turned out to watch. Needless to say, it was a very big deal and so exciting. Seeing the huge elephants coming down Union Avenue was quite a sight to behold. What a day! What a day! Anyone remember that? My son loved that place - he was young and the put gummie worms in his ice cream sundae - I know the chicken place that was near the Marget , but I do not think it was KFC - as I recall they speciallized in Broasted Chicken - how 'bout the Boulevard - they had great hot dogs. Remember the animal petting zoo that used to be accross from funspot? Remember when B Maes was called B Mae Dennys but they had to change the name because of the Dennys Restuarant chain? I could go on and on - and I may in my next post! Well, I am 2nd generation at the lake. My dad was at the lake in the 20's. and early 30's returning in the 50's. He spent time at the Y camp on Bear Island in his youth and he had a boat on the lake back then too. I have been coming here since 1957. Next year I will be in the top age category !!!!!!!!!!!!!!!! Does anyone remember the Captain's Table that used to be around the corner from the Margate, they had a trout tank outside and as kids we would feed the trout while waiting in line for dinner. I also remember the White Owl motel that was where the Shaws is today, there was also a KFC there with the huge bucket sign, they moved down the street I noticed today. Also does anyone remember when Mamouth Mart was across from the airport? I am the 5th generation on the lake. Although my great, great, great, grandfather is buried in the Quaker cemetery (Friends Cemetery) in Center Sandwich. Uriah Hoag. A real smart guy, as far I am concerned. Does anyone remember the Captain's Table that used to be around the corner from the Margate, they had a trout tank outside and as kids we would feed the trout while waiting in line for dinner......Also does anyone remember when Mamouth Mart was across from the airport? I remember "The Mart" being built. It also comes to mind someone lost their life putting up the water tower. I remember hearing it on WLNH AM, FM wasn't around then. The Captain’s Table and the Windmill were two different restaurants. The Captain’s Table occupied the present Lakes Region Veterinarian Hospital building, while the Windmill Restaurant was at the bottom of White Oaks Road. The building is still there but I don’t know what it is now. It was an antique shop and a paint store for a while after the Windmill ceased to be. 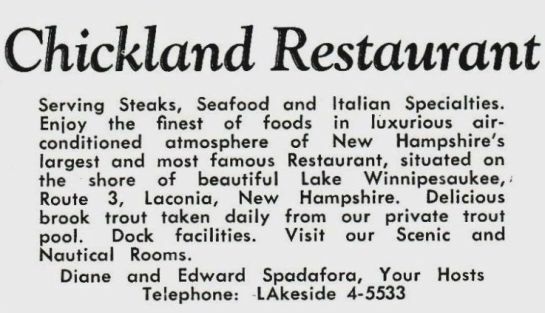 The Captain’s Table was first known as Chickland, a restaurant built about 1958 by Edward Spadafora. He later changed the name to the Captain’s Table and it operated under that name until around 1981. After that time it had two or three different owners and all specialized in seafood. They had seafaring names but I can’t recall what they were. I believe one of them had “Anchor” in the name. Wonder if anyone remembers these restaurants? It operated as a Wendy’s in the early to mid 1990’s, prior to Wendy's relocation to Lakeshore Road. I remember the White Owl Cabins and next to them were the Bluebird Cabins, then the Douglas House on the same side of the street. On the lake side of the street (next to the cemetery) were the Sunset Cabins, Happy Landing Cabins and Douglas House owned a piece of property on that side, as well. Then there was the Swedish Village with its distinctive red cabins dotting the landscape. All gone but not forgotten. Hi Chickie! These questions about the OLD days do bring us out don't they?? I remember eating at The Captain's Table, and I think, also, one of the later seafood ones. Like you, can't remember the name (does that say something about us or the place???). It seemed to me The Captain's table was always pretty busy... so,just like my question relative to The Big Banana, I wonder why it went away? That was "Burger Alley" then, and having a decent seafood place there was great. Even now, it seems surprising that this pretty water location hosts a Veterinarian (no offense to the Vet) and not a nice eating place! Not enough parking? I do have a question about "The Mart". I do (barely) remember it. Was it in the location that The Globe eventually moved to, from the bottom of White Oaks Rd.? Isn't that now where the movie theater is? I liked the old original Globe store, and you couldn't beat their bargains. IMO it never was the same after it moved...oh well...goodbye "past"!! 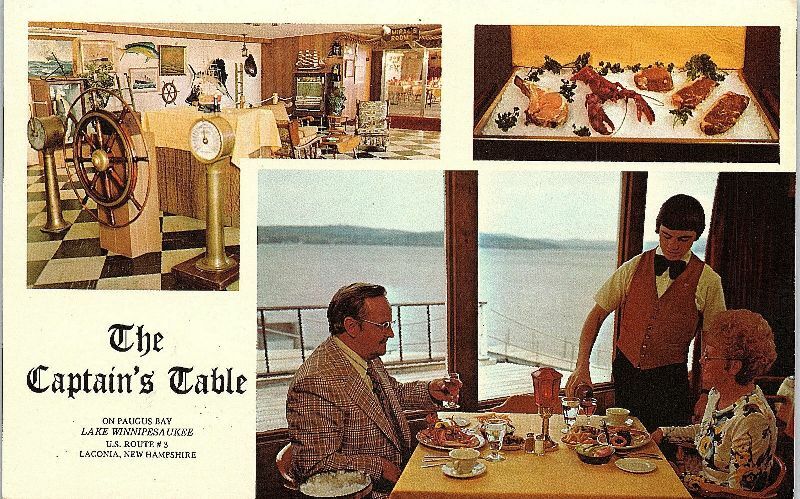 The owners of the Shore Diner purchased the Captain's Table around 1970 and operated it until 1981. 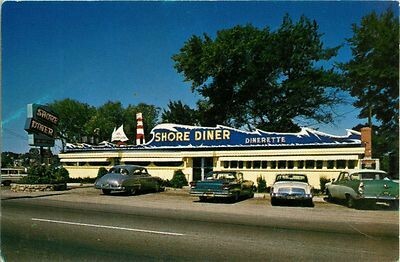 The old Shore Diner was torn down in 1973 to make way for Burger King. After they sold the Captain’s Table in ’81, they operated the Paugus Diner just up the road. I don’t know why those seafood restaurants went out of business. They all started off with a bang but patronage eventually dwindled. I guess it was the sign of the times - people were riding the wave of the new fast food places. Yes, the Globe was first located at the foot of White Oaks Road and was actually an expansion of the old Keller’s Ice Cream building. It was there for several years before moving to the location across from the airport. I am not certain about this, but think the “Mart” was built while Globe was still at the first location. They ran concurrently for a few years and when the Mart closed, the Globe moved there, as it was a larger building. Everyone loved the old Globe. If you couldn’t find an item anywhere, you could find it at Globe and at quite a bargain price. Wow, I guess the McDonald's opening WAS a big event!! I think some of the readers might get a kick out of this, but you can back me up, Chickie. They had the police out on Union Ave. directing traffic, which was backed up in both directions, big-time! You just inched along, and the parking lot couldn't begin to hold everyone. I had to drive by to get home, and my two girls wanted to stop in the worst way...but we had to wait a few days until things quited down. For McDonald's!! Over the years "it growed"--like Topsy--with at least two additions--at different times-- out to the right, as you faced the front. Have had many a cup of coffee with friends there at McDonald's, and--eventually--watched grandsons bouncing around in the tub of balls. Where has the time gone! Yes, the opening of McDonald's brought an onslaught of people who had been anxiously awaiting their first taste of those cholesterol filled burgers we all grew to love. The menu was quite limited – hamburgers, cheeseburgers and fries, as I recall. I don’t believe the fish sandwich had been introduced at that stage - definitely no Big Macs and no drive-thru window. They had six to eight ordering stations and there were long lines at all of them during the lunch and dinner hours for weeks to come. It was a busy place. Burger King never cause such a stir when they opened a couple years later and the subsequent fast food establishments were generally greeted with a “ho-hum”. The age of fast food had come to Laconia and Union Avenue was soon to be transformed into Fast Food Lane. You're bringing back too many memories. I guess I am getting old. I remember decades at the lake. Alton Bay, my kids-now 19 & 17 coming since they were born!! I am on the leading edge of the baby boomer generation 31-Dec-1946. I am old enough to remember the Shore Dinner and the ice cream parlor across from the old Swedish Village next to the golf driving range. The big thing for me as a child was to reach the age where I could skipper our boat. It was a wooden row boat with a 5 HP Evinrude on the back. I have been coming to the lake since 1957 and at one point in the 70's purchased a home on Long Island for a outlandish price of 44,000 including 300 feet of waterfront with dock and swim platform. Marriage, 2 Children and job assignments around the world forced us to sell it. If we kept that and put zero into our 401K over the years, we would be well off today since the house sat on two lots. Someone has to remember something I don't. I sitting here thinking of all the different places thinking someone has to be older than I am. Right now only some of the post cards are. I'm 67, 3rd generation in Wolfeboro, wonderful wife, wonderful children, wonderful grandchildren. If the next 67 years will be as good as the first 67, sign me up, I'm ready. After reading through all the posts, it appears that I am the youngest to post so far in this thread, with 47 other under 30's someone has to be younger. I am 27 (28 on 9/11) and remember the Big Bannana, no NHMS and the exit 20 Tilton strip being built up. I am sure there are other things in my time frame that are just not coming to mind. ..... I am sure there are other things in my time frame that are just not coming to mind. to a place called 'Teen Haven'. The place use to hold teen dances, and they had live bands! We use to dance till midnight. Met many girls there both local and those vacationing like myself. It was a safe place for kids to meet and have fun, no alcohol or drugs. I still have fond memories about this place. I only joined the Winnipesaukee Forum this week so I am like a kid with a new toy. I first came to the lake when I was nine and had a new baby brother. I am lucky to have purchased something and find myself saying out loud that I love it here several times a day!!! "The older the fiddle, the sweeter the tune!" PS. White Rock. I was the proud owner of a genuine Matel Seargent Saunders tommy gun! 'Used red dot caps! Loved toy guns! Gee we didn't grow up to shoot up the world. I had a Daisy Cheyenne rifle Mattel 45 Pistol that used greeny sickum gaps and a Mattel Guerrilla Tommy Gun. Take look and see what those old guns a worth to collectors now! We would watch COMBAT, I think it was on Tuesday nights. I am second generation Winni lover. Mom & Dad introduced my sister and I to Lake Winnipesaukee when I was about 7. Can't remember all the details of that initial stay at the lake; but I do remember my Dad driving around the lakes region in our trusty 1949 Ford 4-dr sedan looking for a place to stay. By chance, we found a vacancy in Wolfeboro. It's been a love relationship ever since; although we now tend to gravitate toward Moultonborough/Center Harbor/Meredith. After Mom died in 2001 (Dad in 1987). My sister and I cruised out just beyond Wolfeboro Bay in the boat and threw two red roses into the water as a "Thank You Mom & Dad" for bringing us to this wonderful paradise. I'm 65 years old now..feeling like 45 with plenty mor lake visits planned.!! I will be 61 soon and enjoying the best time of my life!!!! Good grief I am now two years older than when I first posted here...and that is seriously old!! It's been fun to re-read this thread. The best part for me, however, is that the Forum makes me feel much younger!! Not only that, in the two years gone by, I have actually met--in person--Chickie and the R-guys! I've also made a couple other friends. It's lots of fun! WOW, I remember TEEN HAVEN in Weirs, just got in contact recently with a boy I dated from Welch Island back then. I've decided: I'm just going to live forever. So far, so good!! Interesting poll numbers.Only 20% are under 40.The other 80% over 40. Mentioned several time in this thread "The Captain's Table"
One of the first and very fondest memories of visiting the big lake for the first time as a little boy, and we ate there that day. Something that I will never forget along with a visit to Irwin Marine to just look at the boats. Oops. Can we re-vote? I've changed brackets since this poll came out. The Captain's Table is mentioned. I can't recall where exactly that was. Teen Haven is also mentioned...Man! Do I have memories of that place as well as Irwin Gardens. Could we add another category...Over 80? Or two...Over 100? Then I won't have to be in the last category. Christmas Island Steak House, maybe ? Last edited by Top-Water; 01-19-2019 at 09:15 PM. Also mentioned a few times is the thread. The Paugus Bay water front is just beyond the building on the other side off this street view. As mentioned "Those were the days!" Maybe the "Car" buff's can identify the years and models of the cars in photo. The cars I see in these old photos. I have to remind myself these are not photos of old cars but old photos of new cars. Also mentioned a few times is the thread. The Paugus Bay water front is just beyond the building on the other side off this street view. As mentioned "Those were the days!" The newest car is the green 1958 Pontiac (left). The other green car is a 1956 Dodge (right). The white convertible is a 1956 Studebaker Sky Hawk. It had a Studebaker "look" to it, but had to look it up. The same model as a coupe sold recently at auction for $37,000, and went to Britain. Thank you for the vehicle identifications ................ that was quick, didn't think anyone would know them. Well, I was a kid when my dad had to paint the top half of the car headlights black, and we had those red and blue ration discs. We used to watch the blimps float out of South Weymouth, MA. Search lights were part of our defense. Take a guess! 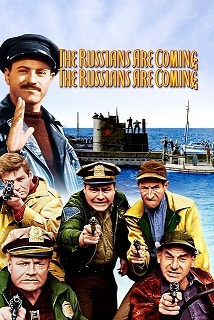 Obviously it was 1966 when everyone on the coast line of Massachusetts was in a panic about the invasion. Very likely Barney Bear is correct with WWII ration tokens. Back to the lakes region. And also mentioned in this thread. 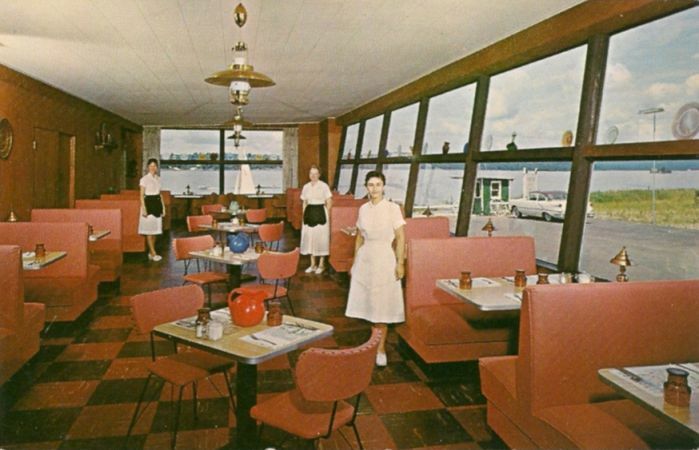 The Captain’s Table was first known as Chickland, a restaurant built about 1958 by Edward Spadafora. This area of the lake has changed so much "Chickland" actually came in two different flavors. I'm pretty sure the green flavor was first, just an assumption. based on the amount of trees in the back ground. I think that the pinkish red version was latter. Paugus bay is in the background. In the second image you can just make out "Little Island" in the background. Now-a-days can you actually have a restaurant called "Chickland" ? Maybe one of the historians here would know if in the pinkish red version photo what that little green building is outside. Was that the landing for the "FOXY BOAT" service. (See link below) I'd love to know if it was their lake port departure and arrival location. So much has change in this location over the years it's hard to remember where everything was back then. Awesome photos thank you. So much history and so much changed. I really wish I had discovered the lake earlier in life. I was almost 40 my first visit. . But as they say better late than never. 65 years old and coming up on 65 Summers on the lake in Alton Bay. I am 64. Have had the privilege of being involved at Lake W for 60 Yrs. I have family who is six generation at same camp on Birch Island. Now that's a legacy! I'm now 66 (changed categories since I answered the poll) and have been at the lake since 1959. Had to laugh when I saw this movie mentioned. My grandparents took us to see it at the Colonial Theater in Laconia. We stay at Sandy Point. My grandfather left the lights on in his 1959 Chevy, and naturally when we got out of the movie the battery was dead. By the time we got out of the show and found the car wouldn't start, the sidewalks had been rolled up and no one was around. My grandmother and younger brother stayed with the car, and Pop and my brother and I started walking. We were on Union Ave. and a policeman stopped and wound up taking us to Cantin Chevrolet where a tow truck was on night duty. He took us back and got the car going again and we drove back to Sandy Point hoping that the car would be fully charged by the time we arrived. Still watch the movie whenever I see it's on. "Emergency, everyone to get from street!"